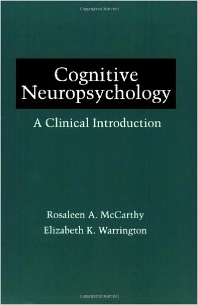 This book is unique in that it gives equal weight to the psychological and neurological approaches to the study of cognitive deficits in patients with brain lesions. The result is a balanced and comprehensive analysis of cognitive skills and abilities that departs from the more usual syndrome approach favored by neurologists and the anti-localizationist perspective of cognitive psychologists. Graduate students in neuropsychology and clinical psychology, and students in neurology and psychiatry. Introduction. Visual Object Recognition. Face Recognition. Spatial Perception. Voluntary Actions. Language Comprehension. Word Retrieval. Sentence Processing. Speech Production. Reading. Spelling and Writing. Calculation. Short Term Memory. Autobiographical Memory. Material Specific Memory. Problem Solving. Conclusion. Index. The National Hospital for Nervous Diseases, London, U.K.